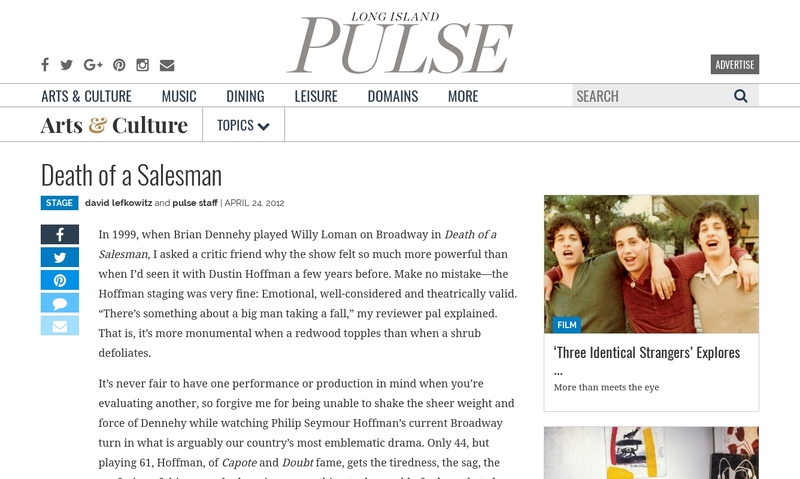 In 1999, when Brian Dennehy played Willy Loman on Broadway in Death of a Salesman, I asked a critic friend why the show felt so much more powerful than when I’d seen it with Dustin Hoffman a few years before. Make no mistake—the Hoffman staging was very fine: Emotional, well-considered and theatrically valid. “There’s something about a big man taking a fall,” my reviewer pal explained. That is, it’s more monumental when a redwood topples than when a shrub defoliates. It’s never fair to have one performance or production in mind when you’re evaluating another, so forgive me for being unable to shake the sheer weight and force of Dennehy while watching Philip Seymour Hoffman’s current Broadway turn in what is arguably our country’s most emblematic drama. Only 44, but playing 61, Hoffman, of Capote and Doubt fame, gets the tiredness, the sag, the confusion of this man who has given everything to the world of sales only to be tossed aside like the peel of a squeezed-out orange. Hoffman’s Willy is a man caught between the seemingly attainable dream of success (“riding on a smile and a shoeshine”) and all the evidence that his stunted sons will not grow up to be world-beaters. What we don’t get in Mike Nichols’ staging of Arthur Miller’s classic is a sense of epic loss. This Willy is a man defeated before he even reaches the porch steps to begin the play. That he’s a hardworking nobody laid low by a country that no longer has use for him is made abundantly clear, but how much more gripping the story would be if Willy had a giantness in him, a life force robbed from him bit by bit. Instead, we see a sympathetic but oblivious blowhard fighting a losing battle against becoming pathetic. Linda Emond makes a convincing case for Linda Loman as a woman forever appeasing her husband just to keep him from going ‘round the bend. Yet I still miss 1999’s Elizabeth Franz, who fought ferociously to shield her man from the collapse of his hopes. Again, unjust comparisons for different approaches, but the Robert Falls staging left me gut-punched and wrung out. The production, now at the Ethel Barrymore Theatre (which harkens back in its set and sound design to the play’s 1949 Broadway debut—I’m obviously not the only one haunted by ghosts here), earned my respect, but not my devotion. And if I was wrung out after its three hours, it was mainly because of the theater’s stuffiness and cramped seating. Those may seem like minor complaints, but if you want an audience to pay attention, attention must be paid. David Lefkowitz founded TotalTheater.com and co-publishes Performing Arts Insider. As the programming director for UNC Radio, David hosts Dave’s Gone By (davesgoneby.com). He also co-wrote and directed the stage play, Shalom Dammit! An Evening with Rabbi Sol Solomon (ShalomDammit.com).